This do-it-yourself replicator features eight Lite-On CD/DVD burners. By flipping the disc over you can burn images onto the top using the drive lasers. 8 x (yes, eight) Lite-On CD/DVD 5.25″ SATA burner drives. Gigabyte motherboard with lots of SATA ports. Nero Multimedia Suite 10 for concurrent audio and data burning with multiple burners. You don’t have a lot of easy-to-use alternatives here, and I’ve also noticed a few glitches with Nero. Keep your eye out for sales here and you can pick up a copy dirt cheap. 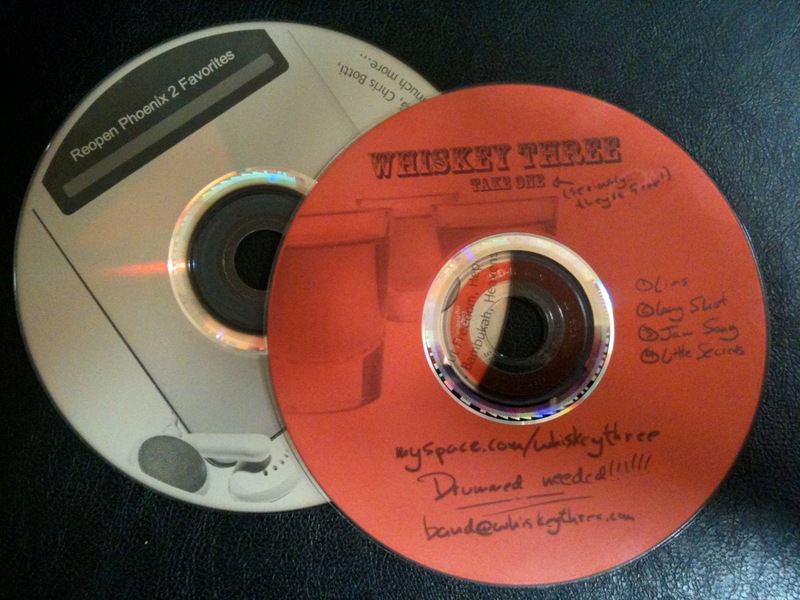 CDs burned with LightScribe technology. Discs come in many different colors. I decided to create all my replicated discs using LightScribe technology. This allows me to flip LightScribe CD-Rs upside-down in the burner and use the laser to burn custom graphics onto the top of the disc. I also made the command decision to use COTS cd sleeves instead of CD Jewel cases or slimline cases. The plastic ones are more expensive, always crack, and are pretty much useless from the start since most people seem to rip their CDs nowadays anyway. Sleeves protect the disc, come in many colors, are far less expensive, even cheaper in bulk, and perhaps best of all can be printed on directly though ordinary laser and ink jet printer. The system runs Windows and Ubuntu. 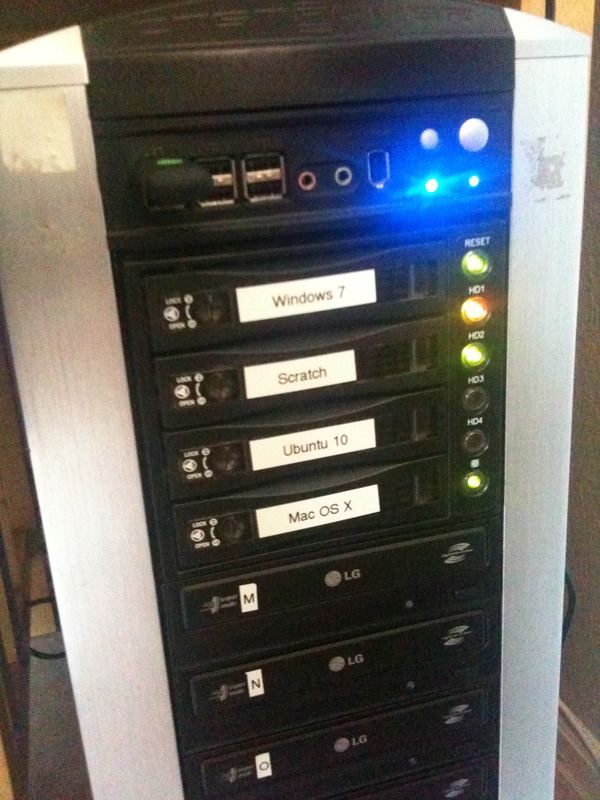 Additional drives are interchanged using hot-swap SATA drive modules. Inexpensive initial fixed cost of hardware parts and software licenses. Quick data, audio and LightScribe replication using 8 concurrent burners. Doable by anyone capable of building of PC with a little time can build one. Functions beautifully as a normal desktop computer. Not completely automated like some commercial units because disc loading, unloading and flipping (if using LightScribe) is a manual process. Still uses CD-Rs. These are not the same as commercially pressed mass media discs, but a lot cheaper. 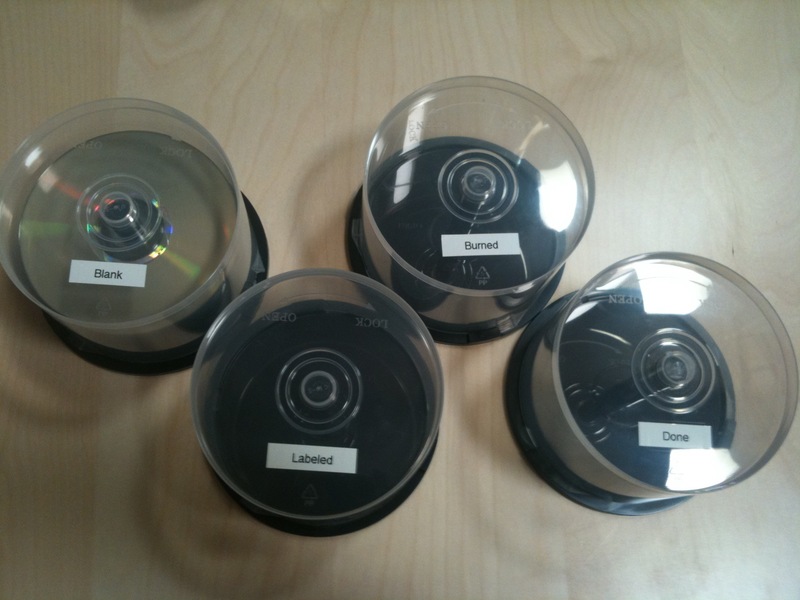 Label four empty CD pancakes to manage the assembly line replication process. If you don't you'll get your disc piles confused! My primary purpose for this buildout is to replicate audio CDs as quickly as possible for Sonic Binge Records: the awesome music production company. In particular, I need to quickly replicate a pancakes worth (usually 25-50) of audio CDs as inexpensively as possible. After much trial and error with the process, this is what I’ve found works best. Take four empty CD pancake containers and label them “Blank”, “Burned”, “Labeled”, and “Ready” to create an assembly line process. You can of course save these for future jobs. Use Nero Burning ROM to replicate batches of 8 at a time. 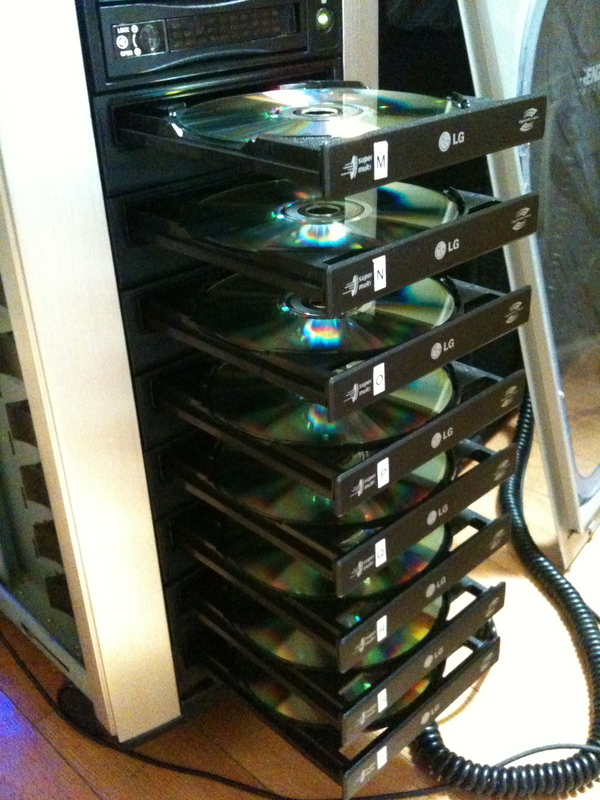 When they’re done, be sure to put them in the “Burned” stack so you don’t get burned discs confused with “Blank” discs. While they’re burning, use your favorite document application to design your printed CD sleeves. I’ve started buying color variety packs in bulk packs of 300 to keep options high and costs down. Take discs from your “Ready” pile (as they finish getting labeled) and slip them into sleeves to create the final product, suitable for general distribution. The imaging lasering adds a great, distinctive touch, and of course you can get as creative as you want with the sleeves, too. Fixed: ~$1K for the machine build, with about $400 of that just for the burners. I reused/reposed parts from old junker machines where I could, and could have saved some money by buying online. I was in a rush and just went to the store. I hope you’ve found this rough how-to guide both inspirational and informative. It’s very useful to have a replication machine handy, and if you’re actively working with people on projects intend for distribution it’s a great investment! Please use this comments section for all your general comments and questions and I’d be happy to address them. Thanks for reading!